Enchant is a brand new event coming to Vancouver this holiday season, with the promise of illuminating the city with the world’s largest Christmas light maze. Enchant will have 55,000 square feet of brilliantly illuminated sculptures along with the light maze. The market will have over 40 local vendors, 12 food trucks and a licensed eating area where guests can enjoy their favourite holiday drink. There will also be a VIP Christmas Party area. Tickets are available now online for specific dates. Season passes are sold out. Follow Enchant on Twitter and Facebook for more information leading up to the holiday event. 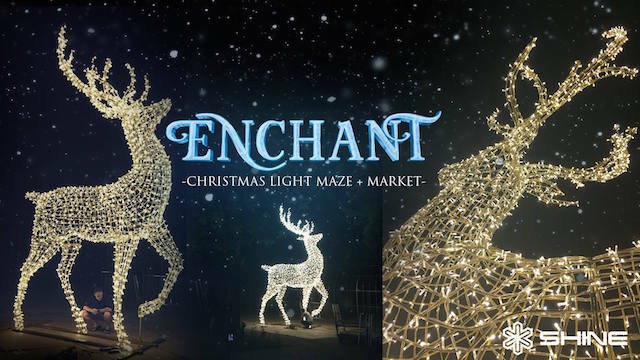 UPDATE December 8th and 22nd are fundraising nights at Enchant Christmas where you can support Variety – The Children’s Charity of BC. You can also use code VCC2016 to automatically donate 20% of your ticket purchase!